Does Coke’s Cross-Channel Soda Fountain Support Work? The more technology is introduced into our physical worlds, especially on account of brands, the more critical that supporting campaigns will become. It’s not enough just to introduce a new machine, system, or even engagement based on a new technology and expect that the mass will conform, use it, and god forbid, actually like it enough to use it over and over. It has a much better chance of succeeding – given the assumption that the machine, system or engagement is technologically sound – if brands use other channels, communications, and ultimately dollars to raise awareness and drive engagement. 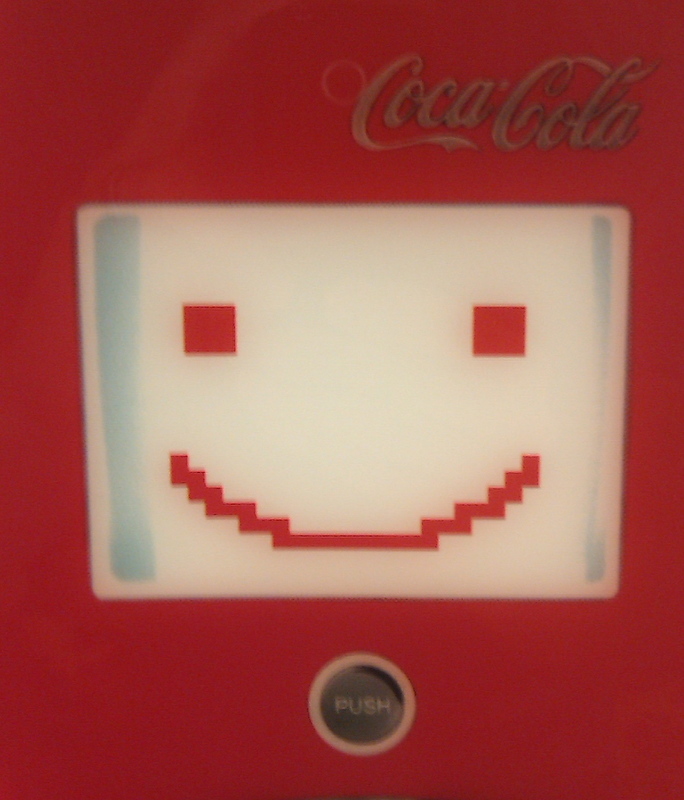 I’ve written before about Coke’s new touchscreen soda fountains – the ones loaded with 106 flavors. They’re pretty cool machines – efficient, easy to use, and a little fun, but they sure do take up a lot of room, especially given the fact that they only service 1 person at a time. These machines are a fairly drastic departure from something (the “standard” soda fountain machine) that has been around for years and that the public is conditioned to use. These machines provide a new way to accomplish a pretty important task, one that is taken thousands of times per day. Now, on one hand, I don’t know if the public cares enough about how they get their soda when they’re out and about, and even further, if they would ever care enough to form an opinion. If I didn’t geek out about things like this, I wouldn’t. But on the other hand, one thing that I’ve learned over the years is that, despite what I care about, there’s someone out there – and usually a group of people – who have their own likes and dislikes and care about things like soda fountains. So, there’s a faction of public opinion at play here that could ultimately surface in one way or another. Now, the truth of this is that, unless public opinion was/will form into a complete backlash against these machines, they’re not going anywhere. They’re only going to be distributed to more movie theatres or restaurants as time goes by. So on some level, the public is going to have to deal with this new way of getting soda from a fountain, regardless of what they actually think of them. 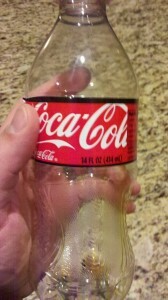 Here’s where Coke is really good. They recognize the need to gain support of this new way of doing things. So, the first step is to raise awareness, but their approach is to not raise awareness of the machine itself; it is to raise awareness of the benefit that the machine provides. This one machine can give you any flavor out of the 106 in its system and/or any combination thereof. No more being limited to the top 6 in its lineup because that’s all the “standard” fountains had room for. Yes, you could make a cool suicide (mixing all the flavors into 1 cup) then, but now, you can make an AWESOME suicide. Seriously. Enter the creative campaign that they’ve launched – in the social channels and on mobile – to support (and gain support for) these new machines. 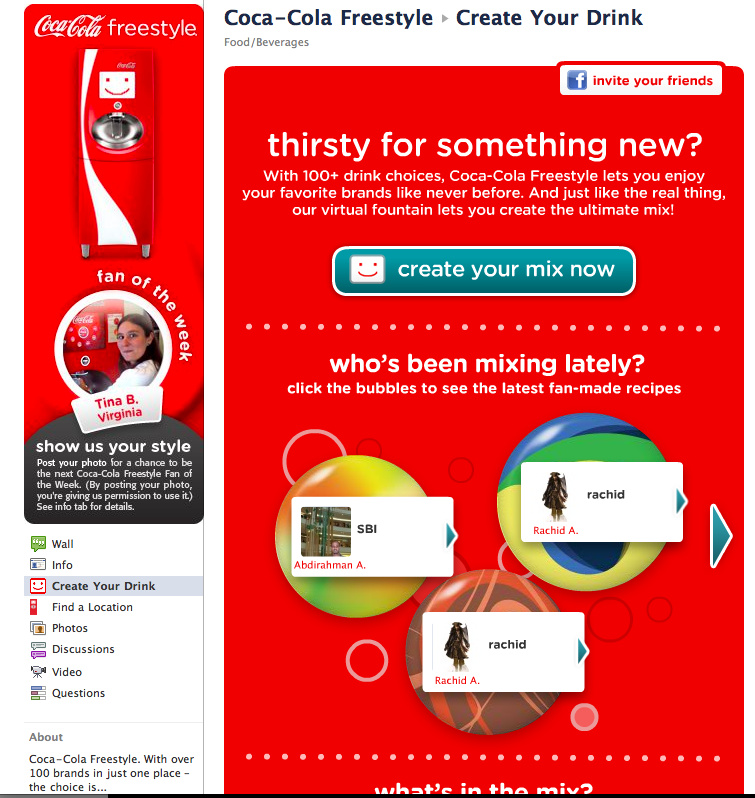 Their Coca-Cola Freestyle application on Facebook gives users the ability to (virtually) mix any drink they want from the myriad of flavors, give it a special name, and share it with the world. Trivial? Perhaps. But it’s fun. And it doesn’t take a lot of time, and it’s super simple to use, and it’s catchy enough to get other people interested. After I made my own drink, I posted it on my Facebook wall and a couple of my other friends got involved and made their own drink, too. Right now, the page/application is at 41,000 strong. Modest numbers, but I think this campaign is centered around deeper engagement, given that someone has to download an app and make a drink to really get involved. There is a barrier of entry, so to speak, that takes more active participation than say, a standard tabbed page in a brand’s Facebook presence. So, while raising awareness to as many people as possible (quantity) is key, creating a relatively deeper level of engagement (quality) could be more important to Coke. The campaign shouldn’t be judged by number of fans/likes alone. 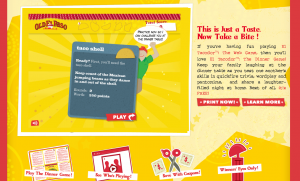 In addition to their Facebook application, they’ve also created a mobile application – a game called PUSH! + Play. This game’s engagement is different than the Facebook application. This is a memory game where you’re introduced to the heap of flavors (still driving the benefit) and you have to “playback” the sequence that the computer gives you, in as fast of a time that you can. It’s not all fun and (casual) games with the two of these applications. Yes, they do a good job of engaging you, but they also do a good job of informing you, too. They allow you to see where these machines are located near you. All of this to say that Coke is being purposeful about how they’re introducing this new way of doing things. I think this is what we can all learn from, especially in the “new” Out-of-Home space where technology is transforming our physical worlds into new things everyday – it’s important to compliment new machines, systems, and/or engagements (and content) with some sort of supporting campaign. Generally, the public will adapt to whatever is introduced, but the adaptation can be helped along through other efforts, like social and mobile engagements. Or print pieces. Or TV spots. More and more, the public consumes and shares media across various channels. This presents great opportunities to introduce and immerse them into the new “thing” that we want them to be aware of and participate in/with. And if we do it right, gain support, enough to accelerate change. So, what do you think? Does Coke’s cross-channel support work in this case? This entry was posted in Emerging Technology, Marketing, Mobile and tagged Coke, emerging technology, Engagement, Mobile, multi-channel experiences, Out of Home, touch screen on 08/30/2011 by Mike Cearley. 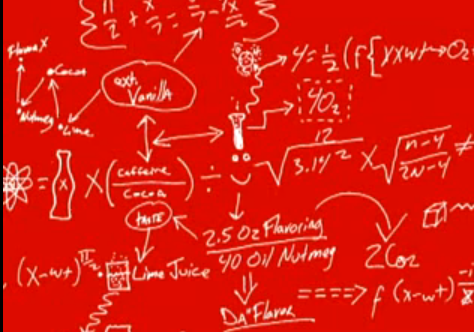 Is Coke’s “Secret Formula” the Secret to Their Brand Story? Out-of-Home – any experience that occurs outside of the home that originates from a platform or device that the consumer doesn’t have to own. 11th Screen – the experience that occurs between the offline and online worlds, regardless of the device or ownership. What I’m looking for are examples of brands who are a) present in the offline and online worlds and b) how well they tell their story in and between the two. From the story comes real brand engagement, at least sustainable brand engagement. I believe that the Out-of-Home and offline spaces have great potential in the brand ecosystem, but they have a different definition in today’s world than they did in the past. Because of this, few brands really utilize them to their fullest potential. So today, we’re going to start the first brand journey with one of my favorite brands – Coke. As a marketer, I stay abreast of what brands are doing (particularly in the digital world), but as a consumer, I’m not fanatical about any brands, so I ‘m not dialed into their every move on every channel. These exercises are truly going to be journeys for all of us. As we go through any of them this year and you know more about the brand/what they’re doing than I’m discovering, I’d love to know any/all of that information. It will only help complete the picture so we can more fully understand the depth and breadth of the brand and their story, and particularly what they’re doing across all of the channels. So, for Coke, what’s the first thing that comes to your mind when you think about them and their brand story? For me, it’s their “Secret” Formula and Happiness. Polar bears and that snappy jingle from way back when are up on the list, but they both play into the Happiness theme. I never really gave much thought to either of them until this weekend when I had an empty coke bottle in my hand. And, I just happened to look on the inside of the wrapper and found a message along with a mobile short code. So I had to text it in. And then the journey began. 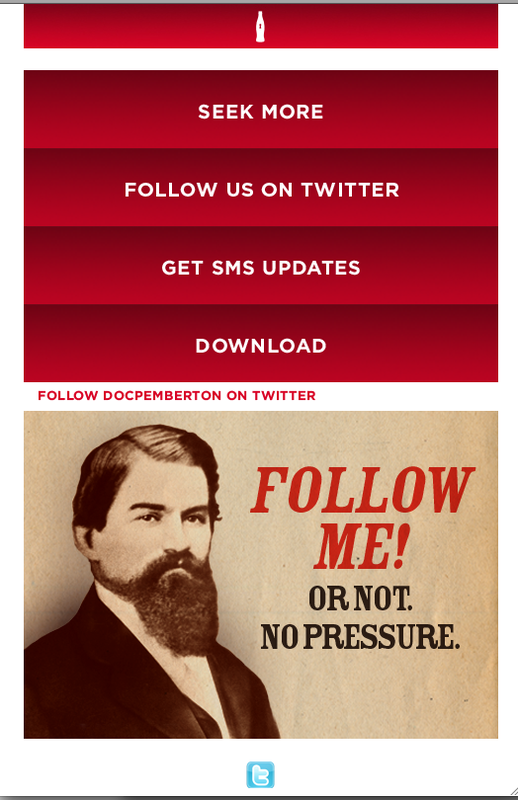 After my text, I received a link to a mobile website where I was introduced to Dr. Pemberton, big and bold, front and center. 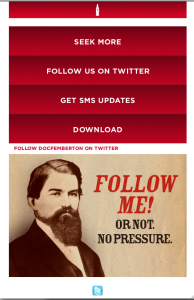 Not knowing who this character was, I had to follow him on Twitter and come to find out, he’s the inventor of Coca-Cola. So, I checked out his feed and saw good, constant engagement. But the more I read, the more I felt they were a little off in the nuances of their brand story, particular in the voice of Dr. Pemberton. I mean, he was born in 1830 and invented Coke in 1885 – two important components of the brand’s story – and the Twitter voice sounds like it’s a 2010 person writing for an 1800’s character. Not an 1800’s character writing for himself. The language and colloquialisms aren’t consistent with what I would expect to hear out of an 1800’s guy. Details like this are critical when writing any sort of narrative and it’s something that would make the Coke story sing a little bit more in my opinion. Why would they want to steal it? Then it was over and I didn’t know what to do next because I was faced with many more videos on the channel. I don’t like getting in this deep, searching through videos and feeds, on my mobile phone. So, I went online to explore more – in a format more enjoyable to me – where I found the same video. But here on my computer, it was interactive. The bottles in the top right-hand corner are clickable (look for them and click if you feel so inclined). While I might not have found the answer on the ingredients, I have learned more about a central character in this story – Dr. Pemberton himself – and have been able to experience and share Happiness with others. All key components in Coke’s story. The experience up to this point has been immersive. I’ve engaged in an interactive, compelling experience. Imagine going through any of this on an interactive kiosk. Or a digital screen. What about getting a little bit more of a hint to the campaign at point-of-purchase? I haven’t found any OOH components to this campaign, but from the digging I’ve done, it seems like there are plans to integrate more offline/real-world components into the experience. Out-of-Home is an ideal channel for a brand to engage consumers in an Alternate Reality Game (ARG) like this. It reaches them when they’re out and about in an already exploring mindset. It would just be critical that the story evolves in more bit-sized chunks because I wouldn’t have the ability, time, and probably even patience to go through everything above in one experience while I’m on the go. But pretty quickly, you can already see how many channels they’ve used. 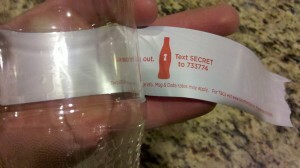 Originating from one simple text message on a bottle in a grocery store. Mobile, digital, and social. Plus offline, via the packaging. (And I see, via some comments on YouTube, that the “Secret Formula” video is a broadcast commercial and currently running.) They could do a little bit better with the offline story, but we’ll have to see what/if anything else rolls out in the future. It’s also important to recognize all of the different forms of content they’ve used. Video (and many different qualities/types), animation, games, quizzes, grunting bears, and Tweets. Not to mention everything else they’ve got going on in their marketing mix, outside of this one campaign experience. Even in one sitting, consuming just about as much information I can about a brand, I am impressed with the thinking and execution behind such an engaging multi-channel experience. It sucked me into the brand via their story. Not through gimmicks or technology, but through a consistent, cohesive brand story. 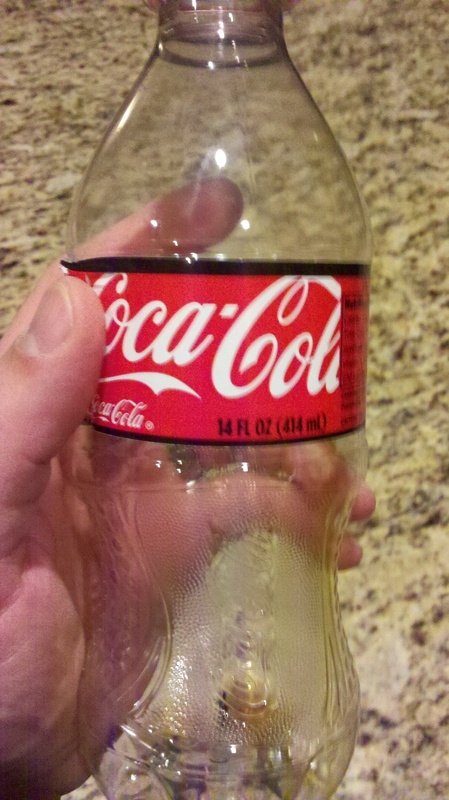 I think that Coke is one of the brands who does it right. I like their advertising and communications approach. They’re dialed into their story and they leverage the power of social media in a productive way for their brand (in fact, they just completed their largest ever social media campaign – Expedition206 – it was quite a campaign.) They obviously have the size and the resources to market and engage on a massive scale. This particular campaign is a great example of a brand using their story to engage consumers, through various channels and mediums, with many different forms of content, and to pass it on to others. Which really might be the true key – “Happiness” is to be shared. Coke knows this and even if they’re not willing to really gives us the answer to their “secret formula,” they’re enabling us to spread what they center their story around. No doubt there will be much more to come on this journey. Have you seen any of these? Did you find the experience engaging? Any other examples from this campaign? Would love to hear your thoughts! 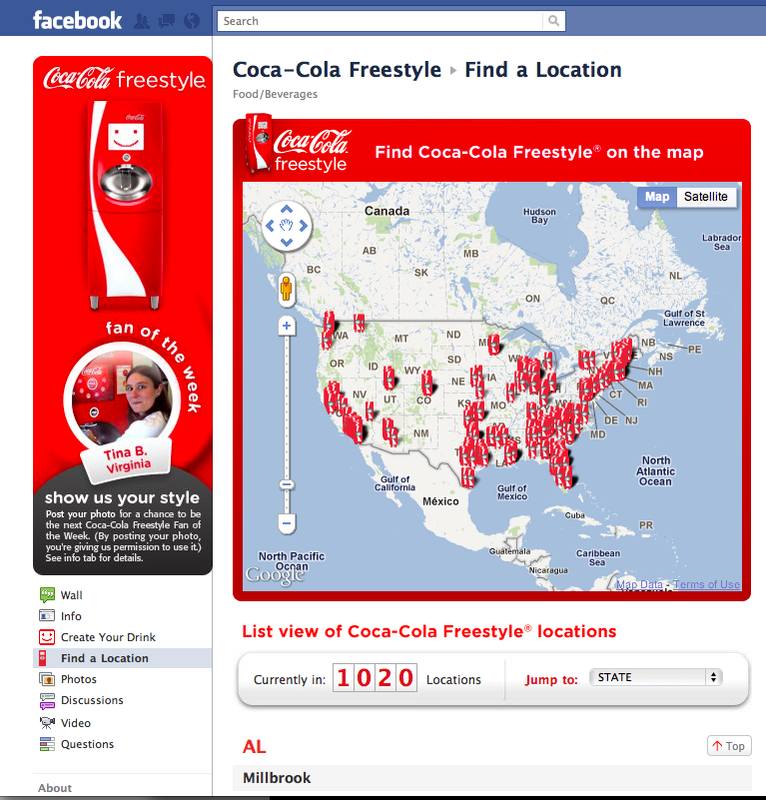 This entry was posted in Marketing and tagged Alternate Reality Game, Coke, Coke's Secret Formula, Dr. Pemberton, Mobile, multi-channel experiences, OOH, Out of Home, video on 01/04/2011 by Mike Cearley. Listen & Learn – What does your audience want? “Video Game Learning Center” – answers some of the needs from their target audience (I just wonder how much “she” is using this??) Her needs are all about easy and fun. Is she intimidated by these touch screens? Let her drive – Consumers are becoming more and more empowered to have personal experiences – IMO and I’ve talked often about this – this is going to be a conscious expectation of the consumer before too long. My Merona – can piece together a fashion look/outfit that she might like (on FB page) My Target Weekly – piece together your own circular based on the regular, weekly Target circular (on FB page) – can filter deals you want and then the coupons. And it keeps a history so it grows over time. Nut – Target understands their target (couldn’t help that one) audience and their story. These 2 key components enable them to tell their story across multiple platforms in a compelling way. They are really pushing the limits in trying to understand all of the channels in today’s landscape and to their credit, using them, even if it’s experimentation. This entry was posted in Marketing and tagged Conferences, Customer Engagement, Mobile, multi-channel experiences, Target, touchscreen on 11/10/2010 by Mike Cearley. 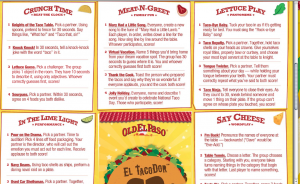 Old El Paso’s Multi-channel Brand Experience – El TacoDor! As I said in my last post, I’m on a hunt to find brands (and examples) who create “complete” experiences, specifically by merging the offline with the online (or vice versa). I believe technology is an ideal way to do this, but not always required. Brands can find many ways to utilize what they’re doing “offline”, in the real world, and drive consumers deeper into the brand experience “online”, in the digital world. And I’m talking about more than putting a URL on packaging. For this experience (and others like it that come after), I’m going to modify my scorecard that I usually use for IOOH. As with that scorecard, I think it’s important to have a guide when looking at these experiences – something that will help focus my thoughts on what I feel is important. Experience – What’s the brand experience? Is it offline to online or vice versa? 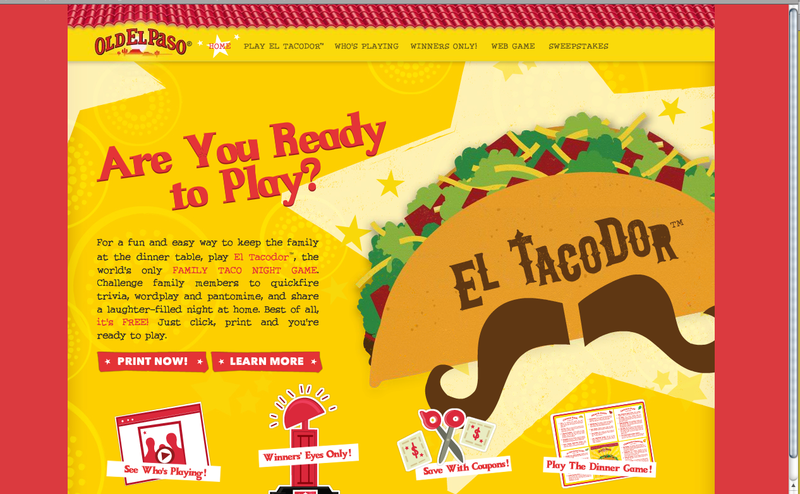 Consumers are driven from the box of Old El Paso taco shells (offline) to the El TacoDor website (online) where they can read the rules to the game, download scorecards, upload content via video/photo submissions, and even share content with their own Facebook communities. The site is actually rich with content and things to do. Purpose – What’s the purpose of this experience? 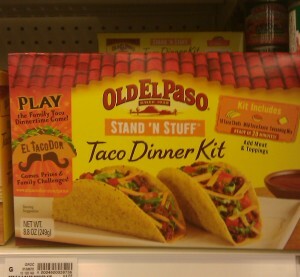 Old El Paso created this game so that families could engage with each other over dinner. 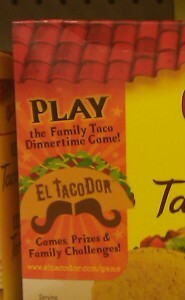 I really like the idea of getting families involved with each other, via game or not, over a meal. In my family, meal-time and eating together is important. We don’t have the TV on, we rarely have music on – it’s just time where we can talk and focus on each other. Old El Paso’s type of engagement here is good. The game doesn’t require a lot and as you can see by some of the challenges, it looks to provide some fun times. Visibility – Similar to “Drama”, here it’s important to understand how visible the call-to-action is that drives people from one channel to the other. In this case, the call-to-action is to play the game, which is found on the box. I’m no expert in packaging, but I have to say, I almost missed it. Just like anything, design plays an important role in how prominent something is. In this case, the call-to-action is up against an orange background and just fades into the packaging on the box. I don’t feel like it’s special enough. It doesn’t scream, “hey, I’ve got something fun for you guys to do around your dinner table!” The elements are there, it just doesn’t reach out and grab me. Entry Points – How many “offline” entry points does the consumer have? And how many “online” entry points does the consumer have? How consistent with each other are they? Do they all drive to the same destination? I should start this by saying that the sweepstakes (for $5,000) tied to this game has officially ended (as of March 31, 2010), so I don’t know how much they want to promote this game via their packaging now. That said, the “game” never ends so I was disappointed to see the game only advertised on the box of taco shells. None of the other Old El Paso products mentioned the game at all. Clearly, they went to all this trouble to create this type of engagement online – it’s just a shame that they only used one product to drive people to the game (if in fact, this was the case prior to the sweepstakes ending). Online, I didn’t find many encouraging clues driving to the game either. The Old El Paso Home page doesn’t mention it at all. The Old El Paso Facebook page doesn’t mention it at all. And the Old El Paso Twitter page doesn’t mention it, either. The only other branded online driver I could find is the El TacoDor’s YouTube channel, upon which there are only 2 videos (both from 2009 – one with 2,600+ views and the other with 8,600+ views). What gives? There are various 3rd party sites out there that mention the game, but I think the brand is doing a huge disservice to themselves by not utilizing their own branded channels to drive people to this game. Content – I think there are two parts to this: 1) What type of content sets up the engagement? and 2) What type of content, if any, is generated by the consumers? Here, Old El Paso does a great job of setting up the game, giving users all the tools they need to start and complete the game. It’s real user-friendly. 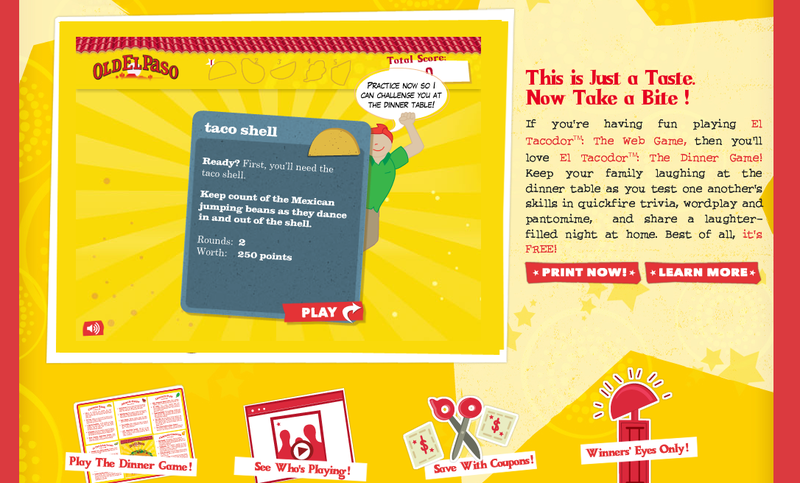 As a little bonus, they even have a web-based game for people who just want to poke around. It’s a silly game, but I played it, and as a result, stayed engaged with the brand a little bit longer. While there was content created by the consumers on the site, I didn’t see very much of it. There wasn’t any real, visible engagement on behalf of the brand on any of the channels – .com, Facebook, Twitter, and YouTube. It all begs the question – is this something that people are motivated enough to do? Speaking from personal experience, no matter how good the idea is, if it’s not going to engage people to the point of spreading the word and/or coming back repeatedly and/or getting other people to see and play it, it probably shouldn’t be done. I think this is a real clever idea, but as a marketer and as a consumer, when I see so little content and engagement on the primary channels, I don’t feel like anyone’s watching. And when no one’s watching, I’m not going to play. Extensions – How deep does this experience go? It’s bringing people from the offline world into the online world, now where all can they go? Here, I thought Old El Paso did a great job of giving the consumers the ability to extend this into their own social networks, specifically Facebook (which certainly helps the game spread virally). They even give users the ability to make their own Certificate of Awesomeness, print it out, and hang it on the fridge, which is a less direct extension, but one nonetheless. I think this is a great touch to this whole experience. There’s an element to this experience that I feel needs to be mentioned, as with any other game – I’m just not sure it goes along with all experiences like this that I’ll be finding and talking about – and that’s the aspect of incentives or rewards. Games can bring people together and enable deeper experiences with brands, but consumers will only do so much for “free.” There has to be some sort of incentive or reward to keep them engaged over a long period of time and coming back for more. Here, there was a sweepstakes tied to the game, but that’s the only reward I could find. Once the sweepstakes is over, what’s my incentive for coming back and interacting with Old El Paso? Why do I have to buy this brand? Now that I have all of the game elements, I can buy the generic products for the cheaper price. Old El Paso doesn’t want that. Simple coupons for consumers who reach a certain level of points (can be low-level) would not only give consumers something to play for, it would send them back into the store to buy more product. This is a key element that is missing from this entire experience. All in all, though, I was really delighted with this experience. It was a smart idea, deep in experience, but didn’t seem to have the support commiserate with what is needed in this type of engagement. I’d love to talk to someone on the brand about the success (or failure) of this experience. With a couple of tweaks, I really feel like this could be a sticky engagement. What do you think? Have you seen anything like this? Great idea – one that merges the offline with the online – but little engagement? If so, I’d love to hear from you! 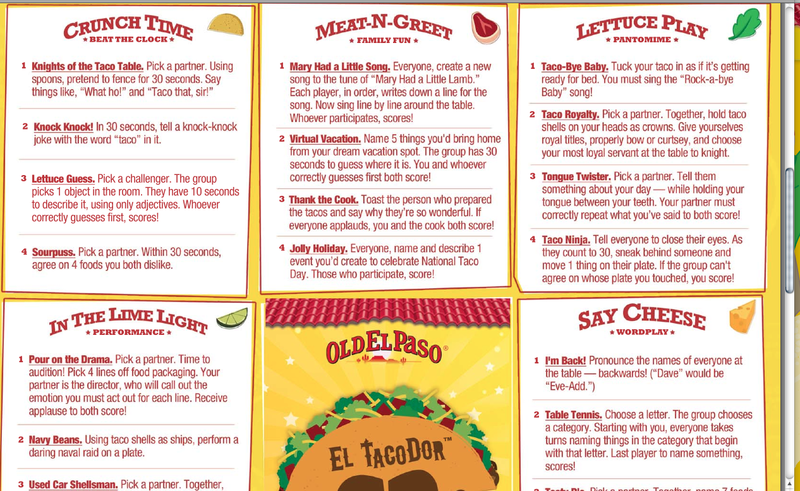 This entry was posted in Uncategorized and tagged brand experiences, El TacoDor, multi-channel experiences, offline to online, Old El Paso on 07/11/2010 by Mike Cearley.